If a Haitian preacher ADMIT having killed people with voodoo in the past, shouldn't he be in prison? 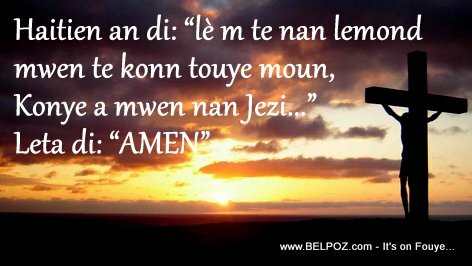 How many times you hear an audio of a Haitian preacher admitting openly on the pulpit how he killed another Haitian supernaturally, turn them to zombies before converting to Christianity? Should these people be in prison? So is that how it is? As soon as you accept Jesus Christ as your Lord and savior, you can get away with murder? Is that how it works in Haiti? Abuse of another human is a violation of human rights. I cannot believe a Haitian who is a born again christian can legally admit to murder and abuse of another Haitian and the Haitian justice system doesn't feel the need to set an example out of at least one of them. "Oh yeah, when before I found Jesus I used to turn people into zombies," one of them said in an audio that is spreading in social media. "I used to tie them up, turn them to horses and donkeys... But now I am in Jesus and all this is in the past..."
What do you think should happen to anyone who admit to abuse of another human being, naturally of supernaturally?